There is no such thing as a one-size-fits-all solar panel solution. Each installation job needs to be carefully considered so the client gets the most solar energy production out of each panel. That’s why our San Francisco company works hard to customize each installation that we do. We want to make sure our customers are thrilled with their solar panels and the energy they are producing for their home. In order to maximize the output, we take several factors into consideration when designing and installing a system. What are your energy goals? 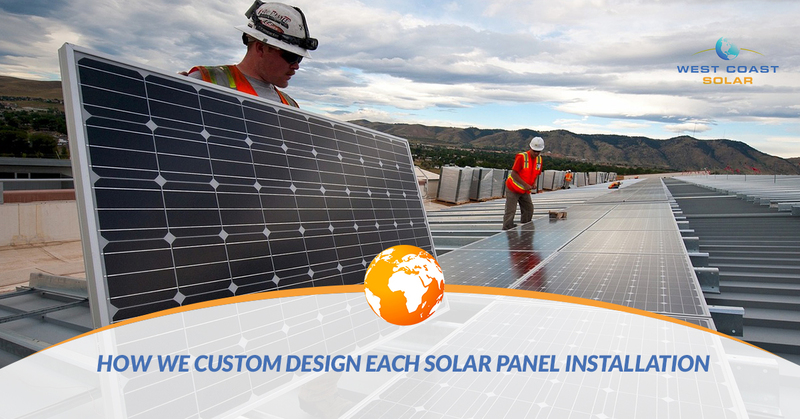 We start by getting to know more about why you are installing solar panels for your home. Are you hoping to reduce your monthly energy bills? Or do you want to eliminate them entirely? Are you trying to live “off the grid”? Whatever your goals may be, our team wants to hear about them and will spend time talking to you about them. Understanding your goals for the project helps us choose the right equipment for the installation project. We’ll also look at your historical energy usage to determine how much energy you are currently using in your home. There are a number of different solar panel options on the market, and we’ll determine which options are best suited for your project and helping you meet your energy goals. How much sunlight does the property get? Solar panels work best in direct sunlight. But even if your property doesn’t get a lot of direct sunlight, there may still be options that will work for you. Our team will carefully observe how much sunlight your property receives on an average day. We’ll also look at when and where it receives that sunlight in order to design a system that takes advantage of as much sunlight as possible. It’s important to remember that your property might get more sunlight that you think; often, we judge the amount of sunlight our properties get by how much sun our yards and gardens get on a daily basis. Your roof may get a lot more sunlight as it’s less likely to be shaded by other buildings and trees, and that could be a huge advantage for solar energy production. How much area is there for solar panels? Roofs come in all shapes and sizes and some of them offer more square footage for solar panels than others. Our team will examine your roof and determine how much space you’ll be able to give to the installation project. There are a number of solar panel options available that can maximize a small amount of roof space, but the more you can give to the project, the more energy you’ll likely be able to produce. With enough room on the roof, you could actually have a negative energy bill; that means the energy company owes you money. Our team will talk to you about how much space we’re proposing to use so you can ensure you are happy with both the look of the finished project on your roof and the projections for how much energy you are going to produce. Our team will talk to you about your budget before we begin so we know how much money you can spend on the project. This allows us to look for solutions that can maximize your energy production without maxing out your budget. Thanks to our experience, we know how to stretch your dollar so you get the most solar power for every penny you spend on the project. We can also talk to you about how much you are likely to save on your monthly energy bills, which is money that’s going right back into your pocket and can help you pay for the cost of installation. Most of our customers find that solar panels are less expensive than they’d anticipated! What challenges or benefits does your roof offer? Finally, our team will take a look at your roof, house, and location and ensure that we have a plan for any challenges or benefits that they might give us. That way, we can help eliminate any unexpected surprises that could come up along the way and make the project more expensive or time-consuming. It’s this extra consideration that really sets our team apart in the solar power industry. We carefully consider the projects from all available angles to ensure our customers have the most positive experience possible and get the results that meet or exceed their expectations. Ready to Have Solar Panels Installed on Your San Francisco Home? Our team is ready to get to work. By taking our time to design a system that’s absolutely tailored to your home from start to finish, you’ll end up with a more efficient and productive solar energy system as a part of your home. It’s also a system that’s going to stand the test of time, so your investment is going to last longer and help to pay for itself over the lifetime of your home. We’re proud of the work that we’re doing in the solar power industry in California and we’re excited to get started on a project for your home. Get in touch with our team by giving us a call or contacting us through our website. West Coast Solar will provide you with a free estimate on the cost of putting one of our great solar panel systems on your home or business today!